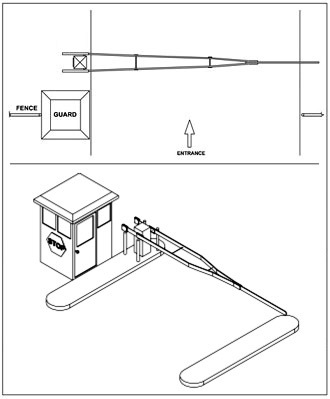 Linear Model SG Parking Gate Operator | Hoover Fence Co.
Linear® The Model SG barrier gate is designed to control large industrial vehicular traffic. The gate can be actuated by different devices, such as radio controls, single and three-button control stations, digital keypads, coded cards, sensing loops, and telephone entry systems. Gate arm opening speed is 11 seconds. For high-use applications on wide driveways, it is recommended to use two Model BGU-12, one on each side of the driveway. The model SG barrier gate control system is designed to accept most available entrapment devices and has function switches that will allow for various methods of control. Duplex receptacle (115 VAC units only). On-board APeX Controller three-button control station. All accessory connections 24 VDC. Easily adjustable cam-operated limit switches. Lockable and removable front cover for easy access. Built-in maximum run timer and auto close timer. Master/second with simple 3-wire connection. Heavy-duty right angle gear reducer. Gate arm clamp with breaker bar. Weather resistant galvanized steel cabinet with powder coat finish. Full system capable for Access Controls and Reversing Devices. Solid state 24V control board UL325/UL991 compliant. Diagnostic LED display for ease of setup and trouble shooting. Integrated maximum run and auto close timers. Built-in dual gate capability using 3-wire shielded cable. 24V DC power available for access control accessories. Arm Constructed of 1x6" soft wood, painted white with yellow and black warning tape and labels on each side.